حضور نیترات در آب‌های زیرزمینی در دو دهه گذشته، نگرانی‌های زیادی را برای مدیران و نیز مصرف‌کنندگان آب به‌ویژه در بخش شرب و بهداشت ایجاد کرده است. از میان روش‌های مختلف حذف نیترات، استفاده از روش جذب به‌علت بازدهی بالا و همچنین ملاحظات اقتصادی بیشتر مورد توجه قرار گرفته است. در این تحقیق، از کربن فعال صنعتی با اندازه دانه‌های 4/0 تا 59/0 میلی‌متر (مش 30-40) به‌عنوان جاذب اولیه به‌منظور حذف نیترات از محیط آبی استفاده شد. به‌منظور افزایش راندمان حذف نیترات این جاذب، چند مرحله بهینه‌سازی شیمیایی مختلف- شامل اسیدشویی، شستشو با سدیم‌هیدروکسید، اصلاح با پلیمر کاتیونی- در نظر گرفته شد. شستشو با سدیم هیدروکسید به همراه اصلاح با سورفکتانت کاتیونی سیتیل تری‌‌میتیل بروماید بیشترین راندمان حذف نیترات را در بین دیگر روش‌های به‌کار رفته از خود نشان داد. پس از مشخص شدن مؤثرترین روش تصفیه نهایی، آزمایش‌های جذب-واجذب گاز نیتروژن، FTIR، SEM برای تعیین مشخصات فیزیکی- ‌شیمیایی و ویژگی سطح کربن فعال انجام شد. آزمایش‌های سینتیک نشان داد که جذب در مدت زمان 120 دقیقه به حالت تعادلی خود رسیده و معادله سینتیکی شبه درجه دوم بیشترین مطابقت رابا داده‌ها داشت. بیشترین جذب نیترات در حدود 34/15 میلی‌گرم برگرم با پیروی از ایزوترم لانگمیر به‌دست آمد. ارتباط زیادی بین جذب نیترات و تغییرات pH مشاهده نشد. بیشترین کاهش در جذب نیترات در حضور یون سولفات و سپس به‌ترتیب برای یون‌های کلراید، فسفات و کربنات مشاهده شد. می‌توان گفت که جاذب تصفیه‌شده با روش شستشو با سدیم هیدروکسید به همراه اصلاح سورفکتانت کاتیونی دارای توانایی قابل ملاحظه‌ای به منظور جذب نیترات است. The presence of nitrate in groundwater resources has instigated increasing concerns among both managers and users of, especially, drinking and sanitation water. From among the different nitrate removal methods, the adsorption method has attracted more attention thanks to its high removal efficieny and economical operation. Commercial activated carbon ranging in mesh size from 30‒40 was utilized to remove nitrate from an aqueous solution. In order to enhance nitrate uptake, different acid, alkaline, and cationic surfactant post-treatments were examined. Alkaline post-treatment followed by cationic surfactant modification was found to yield the best efficiency. FTIR, SEM, and N2 adsorption/desorption were carried out to determine the physical and chemical properties of activated carbon. Kinetic tests revealed that adsortption reached its equilibrium state after 12 hiurs and that the pseudo-second order and Freundlich models. Based on the Langmuir model, maximum adsorption capacity was found to be 15.34 and pH had an insignificant effect on nitrate adsorption. Moreover, the highest decline in nitrate adsorption was observed in the presence of sulfate followed by chloride, phosphate, and carbonate. Based on the results obtained, the modified activated carbon accompanied by washing with sodiuym hydroxide and modified cationic surfactant post-treatment might be recommended for use in adsorption processes as a promising innovative technology for nitrate removal from drinking water. Baghdadi, M., Mazarji, M., Sabouhi, M., Jafari Kang, A. & Jafari, A., 2014, "Removal of cationic surfactants from aqueous solutions by modified cotton as a novel high-capacity and low-cost adsorbent", Journal Advanced Chemistry, 9(3), 2062-2071. Basar, C.A., Karagunduz, A., Cakici, A. & Keskinler, B., 2004, "Removal of surfactants by powdered activated carbon and microfiltration", Water Reserach, 38(8), 2117-2124. Bhatnagar, A., and Sillanpaa, M., 2011, "A review of emerging adsorbents for nitrate removal from water", Chemical Engineering Journal, 68(2), 493-504. Bhatnagar, A., Ji, M., Choi, Y., Jung, W., Lee, S., and Kim, S.S., 2008, "Removal of nitrate from water by adsorption onto zinc chloride treated activated carbon", Separation Science Technology, 43(4), 886-907. Chen, S., Wu, W., Hu, K., & Li, W., 2010, "The effects of land use change and irrigation water resource on nitrate contamination in shallow groundwater at county scale", Ecology Complex, 7(2), 131-138. Cho, D-W., Chon, C-M., Kim, Y, Jeon, B-H., Schwartz, F.W. & Lee, E-S., 2011, "Adsorption of nitrate and Cr (VI) by cationic polymer-modified granular activated carbon", Chemical Engineering Journal, 175, 298-305. Choi, H-D., Jung, W-S., Cho, J-M., Ryu, B-G., Yang, J-S. & Baek, K., 2009, "Adsorption of Cr (VI) onto cationic surfactant-modified activated carbon", Journal Hazardous Materials, 166(2), 642-646. Eddaoudi, M., 2005, "Characterization of porous solids and powders: Surface area, pore size and density by S. Lowell (Quantachrome Instruments, Boynton Beach), JE Shields (CW Post Campus of Long Island University), MA Thomas, and M. Thommes (Quantachrome In-struments)", Kluwer Journal American Chemical Society, 127(40), 14117. EPA., 2012, Drinking water standards and health advisories tables, US Environmental Protectoin Agency. Esmaeili, A., Moore, F. & Keshavarzi, B., 2014, "Nitrate contamination in irrigation groundwater, Isfahan, Iran", Environmental Earth Science, 72(7), 2511-2522. Hassan, M.L., Kassem, N.F. & El‐Kader, A.H., 2010, "Novel Zr (IV)/sugar beet pulp composite for removal of sulfate and nitrate anions", Journal Applied Polymer Science, 117(4), 2205-2212. Hayati, B. & Mahmoodi, N.M., 2012, "Modification of activated carbon by the alkaline treatment to remove the dyes from wastewater: Mechanism, isotherm and kinetic", Desalin Water Treatment, 47(1-3), 322-333. Iida, T., Amano, Y., Machida, M. & Imazeki, F., 2013, "Effect of surface property of activated carbon on adsorption of nitrate ion", Chemocal Pharmaceutical Bulletin, 61(11), 1173-1177. Joekar-Niasar, V. & Ataie-Ashtiani, B., 2009, "Assessment of nitrate contamination in unsaturated zone of urban areas: The case study of Tehran, Iran", Environmental Geology, 57(8), 1785-1798. Kapoor, A. & Viraraghavan, T., 1997, "Nitrate removal from drinking water-review", Journal Environmental Engineering,123(4), 371-380. Khalili, N.R., Campbell, M., Sandi, G. & Golaś, J., 2000, "Production of micro- and mesoporous activated carbon from paper mill sludge: I. Effect of zinc chloride activation", Carban, 38(14), 1905-1915. Krasicka-Cydzik, E., 2012, Anodic layer formation on titanium and its alloys for biomedical applications, University of Zielona Gora, Poland. Li, Y., Ding, X., Guo, Y., Wang, L., Rong, C. & Qu, Y., 2011, "A simple and highly effective process for the preparation of activated carbons with high surface area", Materials Chemistry Physics, 127(3), 495-500. Li, Y., Zhang, P., Du, Q., Peng, X., Liu, T. & Wang, Z., 2011, "Adsorption of fluoride from aqueous solution by graphene", Journal Colloid Interface Science, 363(1), 348-354. 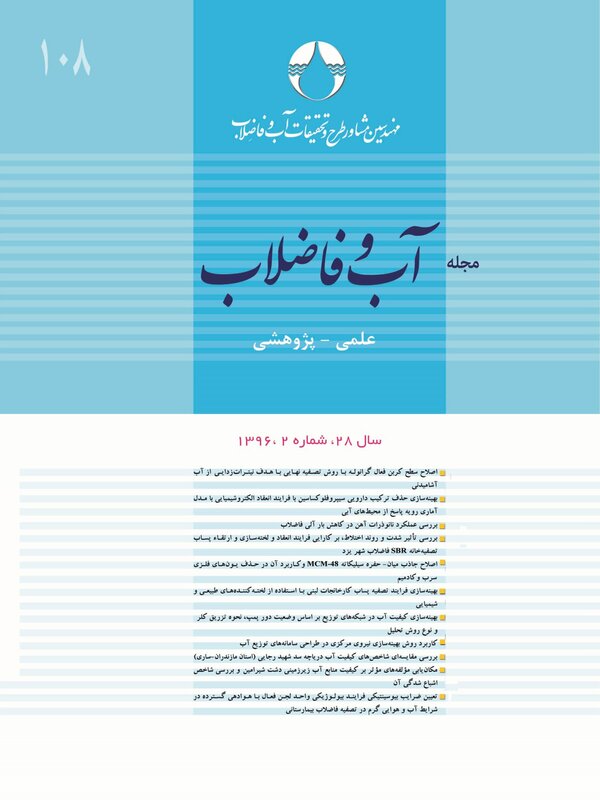 Madani, K., 2014, "Water management in Iran: What is causing the looming crisis? ", Journal Environmental Study Science, 4(4), 315-328. Mahapatra, K., Ramteke, D.S. & Paliwal, L.J., 2012, "Production of activated carbon from sludge of food processing industry under controlled pyrolysis and its application for methylene blue removal", Journal Analytical Applied Pyrolysis, 95, 79-86. Moreno-Castilla, C., Ferro-Garcia, M.A., Joly, J.P., Bautista-Toledo, I., Carrasco-Marin, F. & Rivera-Utrilla, J., 2011, "Activated carbon surface modifications by nitric acid, hydrogen peroxide, and ammonium peroxydisulfate treatments", Langmuir, ACS Publications, 11(11), 4386-4392. Namasivayam, C. & Sangeetha, D., 2005, "Removal and recovery of nitrate from water by ZnCl~ 2 activated carbon from coconut coir pith, an agricultural solid waste", Indian Journal Chemical Technology, 12(5), 513. Nosrati, K. & Van Den Eeckhaut, M., 2012, "Assessment of groundwater quality using multivariate statistical techniques in Hashtgerd Plain, Iran", Environmental Earth Science, 65(1), 331-344. Nunell, G. V., Fernandez, M.E., Bonelli, P.R. & Cukierman, A.L., 2015, "Nitrate uptake improvement by modified activated carbons developed from two species of pine cones", Journal Colloid Interface Science, 440,102-108. Nunell, G. V., Fernández, M.E., Bonelli, P.R. & Cukierman, A.L., 2012, "Conversion of biomass from an invasive species into activated carbons for removal of nitrate from wastewater", Biomass and Bioenergy, 44, 87-95. Ota, K., Amano, Y., Aikawa, M. & Machida, M., 2013, "Removal of nitrate ions from water by activated carbons (ACs)—Influence of surface chemistry of ACs and coexisting chloride and sulfate ions", Applied Surface Science,276, 838-842. Öztürk, N. & Bektaş, T.E., 2004, "Nitrate removal from aqueous solution by adsorption onto various materials", Journal Hazardous Material, 112(1), 155-162. Pacheco, J. & Cabrera, A., 1997, "Groundwater contamination by nitrates in the Yucatan Peninsula, Mexico", Journal Hydrogeol, 5(2), 47-53. Panahi, S. & Moghaddam, M.R.A., 2012, Evaluation of nitrate concentration in groundwater and drinking water distribution network of Robat-Karim City, Tehran Province, Iran, Water Pract, Technol. IWA Publishing, Alliance House London SW 1 H 0 QS United Kingdom. Park, S-J.J. & Jang, Y-SS., 2002, "Pore structure and surface properties of chemically modified activated carbons for adsorption mechanism and rate of Cr(VI)", Journal Colloid Interface Science, 249(2), 458-463. Patterson, J., Parette, R., Cannon, F.S., Lutes, C. & Henderson, T., 2011, "Competition of anions with perchlorate for exchange sites on cationic surfactant-tailored GAC", Environmental Engineering Science, 28(4), 249-256. Rao, P. & Puttanna, K., 2000, "Nitrates, agriculture and environment", Current Science, 79(9), 1163-1169. Spalding, R.F. & Exner, M.E., 1993, "Occurrence of nitrate in groundwater—a review", Journal Environmental Quality American Society of Agronomy, Crop Science Society of America, and Soil Science Society of America, 22(3), 392-402. Thommes, M., 2010, "Physical adsorption characterization of nanoporous materials", Chemical Engineering Techology, 82(7), 1059-1073. Tofighy, M.A. & Mohammadi, T., 2012, "Nitrate removal from water using functionalized carbon nanotube sheets", Chemical Engineering Research Design, 90(11), 1815-1822. Wang, S., Zhu, Z.H., Coomes, A., Haghseresht, F. & Lu, G.Q., 2005, "The physical and surface chemical characteristics of activated carbons and the adsorption of methylene blue from wastewater", Journal Colloid Interface Science, 284(2), 440-446.
WHO, 2011, Guidelines for drinking-water quality, 4th Ed., World Health Organ. WHO, 2011, Nitrate and nitrite in drinking-water-background document for development of WHO guidelines for drinking-water quality, World Health Organ. Yazdankhah, A., Moradi, S.E., Amirmahmoodi, S., Abbasian, M. & Shoja, S.E., 2010, "Enhanced sorption of cadmium ion on highly ordered nanoporous carbon by using different surfactant modification", Microporous Mesoporous Material, 133(1-3), 45-53.